Convenient scheduling– You’re busy, so feel free to book back-to-back appointments for you, your kids, parents, and other loved ones. Gentle techniques– Safe sedation adds to a positive experience, while technologies like digital X-rays and CBCT cone beam scans make examinations easy on little patients’ mouths. 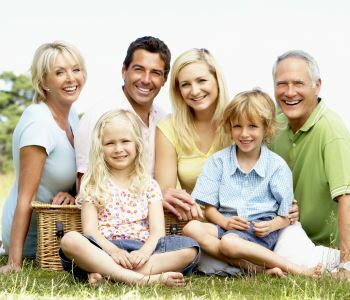 Since there is a genetic component to gum disease, and since so many diseases that run-in families also affect oral health, getting to know your family helps us tailor effective preventive treatments that address specific risk factors. Infants — Early childhood caries is defined as one or more decayed, missing, or filled tooth surfaces among newborns to 5-year-olds. Since the bacteria responsible for ECC can be passed from mother to child, it’s important for women who are expecting to keep up with their dental appointments. We encourage parents to alter habits that damage young mouths; for example, babies shouldn’t fall asleep sucking on bottles full of sugary drink. Babies should drink from a cup by their first birthdays, and learn to eat their fruit rather than drink what may be more sugar than actual fruit juice. School-aged children – The first permanent molar usually erupts around age 6 or 7. These back teeth have lots of pits and grooves that make natural traps for food debris. Both the grooved surface and tooth location pose challenges to proper cleaning techniques. Poor oral hygiene promotes the decay that leads to early tooth loss. Such damage can generally be prevented with sealants. Applied to uneven surfaces in less time than a filling, sealants create a thin barrier between the tooth and harmful bacteria. Like other preventive procedures, they are often covered by insurance. Teenagers –Braces, in some ways, are considered a rite of passage; however, today’s orthodontic appliances are designed to be unobtrusive and comfortable, no silver wires and brackets here! Transparent plastic aligners may be worn as alternatives to conventional braces. These treatments keep your mouth looking beautiful and healthy, because irregular teeth growth may result in bite problems, jaw joint problems and jaw misalignment. Dry mouth– Promotes decay and infections. Periodontal disease – Worsened by old and poorly-fitting dentures and restorations, and other diseases such as diabetes. Hormonal changes – Bleeding gums and dry mouth may arise in menopause. Every family and every patient is different, and what may have worked when you were a pediatric patient may not apply as you get older. Aberdeen Dental Centre takes pride in getting to know patients and their family members, which puts us in the best position to keep you and your loved ones healthy!